Five Star Anti-Aging Slimming Equipment, RF Ultra Vacuum Cavitation Slimming Massage Machine - High quality Taiwan Five Star Anti-Aging Slimming Equipment, RF Ultra Vacuum Cavitation Slimming Massage Machine provides by Jean-Modern's Ind. 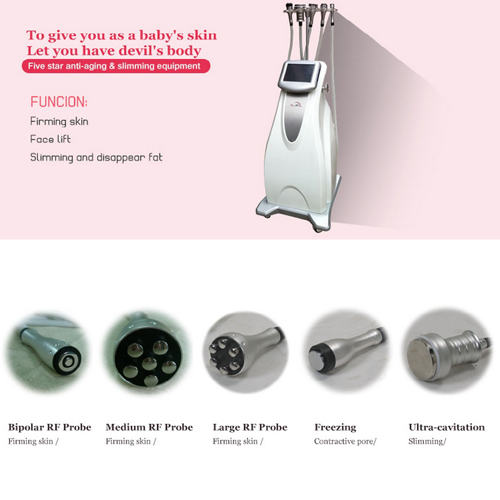 Co., Ltd.
Multistage Circulation Radio-Frequency Apparatus in 1 second internal energy will be treated areas the fields in biological tissues electrical polarity is millions of times, lead to subcutaneous tissue natural resistance movement generate heat, heat stimulation dermis to secrete more new collagen, fill the vacancy of collagen, which again hold up the framework of the skin, restore skin elasticity. in a short period of time more prominent, and treatment scope the thicker more rich and more widely. Body Shape: Body shaping. eliminate excess fat, desalt stretch marks, tighten the skin.